Our research team will be presenting the second of our annual webinar series on on Feb. 23, 2018, from 12 to 1 p.m. 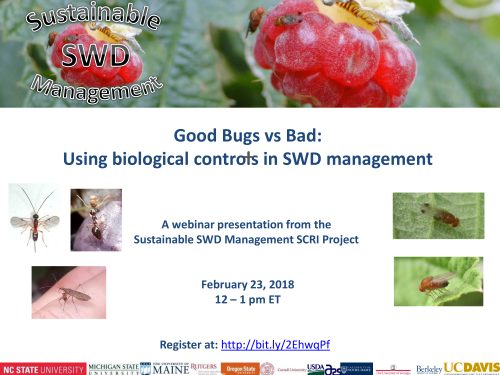 Titled “Good Bugs vs Bad: Using Biological Controls in SWD Management,” this webinar will include an overview of the project, an update on the native biocontrol agents that have been found in surveys at farms from Oregon to Maine, and the latest information on their search for parasitic wasps from Asia. This webinar is free and open to all thanks to funding from the USDA Specialty Crop Research Initiative. Register with your name and email address at Good Bugs vs Bad: Using Biological Controls in SWD Management.